Aidan Gaertner ’20 (pictured, on right) and his family were honored with the “2017 Outstanding Family Award” at the Special Olympics of Minnesota’s annual Distinguished Service Awards ceremony on September 8. Gaertner got involved with the Special Olympics when his aunt, the head coach of the Roseville Flames Special Olympics team in Minnesota, asked him to help coach a new flag football team. Flag football is a “unified” sport, which is an inclusive program that unites Special Olympics athletes and individuals without intellectual disabilities on the same team. Gaertner competed in high school sports and is now a football player at Colgate. He organized a Special Olympics basketball tournament at St. Thomas Academy High School that has since become an annual Special Olympics Day at the school. 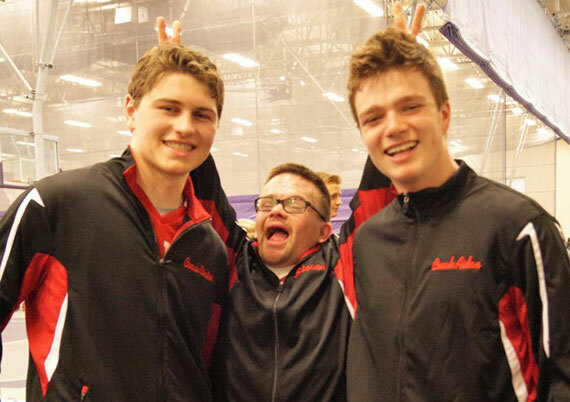 The Gaertner family was selected from nearly 8,000 families within Special Olympics Minnesota to be recognized for their work with the organization. Aidan has been participating as a unified partner — both playing and coaching — in track and field, golf, flag football, and basketball for the past seven years.